I first became aware of The Black Delta Movement a couple of years ago. They're an interesting garage rock band with a bit of psychedelic twist to them. I had listened to their EP's previously and have enjoyed the sound they made. It's like one of those old sixties bands, the ones playing rock before rock music was really solidified as a thing. The twisting and turning music that worked on different levels. They had my attention, to say the least. I've even had the pleasure of talking to vocalist Matt Burr about the band and their experiences [Click Here]. They have been building up a lot of buzz for the last couple of years, playing shows with the likes of The Jesus And Mary Chain, Twin Atlantic and The Temperance Movement. For me, this is the true essence of rock n' roll. Building up that fan base to the point of releasing an album. I managed to get a copy of their new album, Preservation earlier this year and gave it a few spins. Here are my thoughts. The album certainly remains true to the band's core themes and ideas musically. Having that garage sound but at the same time, the weird production lends itself to the slightly bizarre and strange. The light guitar tone and echoed vocal sounds mesh well together. Making for some trippy, weird rock music and the harder riffs really come crashing in. The overall effect is this fantastic soup of noises that swirl around in your head. I really like the moments when the band just all come in together and jam away in the song. Those are the real natural sounding moments, the vibe is great and there's a raw energy to it that makes it fun to listen to. The stand out track for me is "King Mosquito" with that liveliness and solid riff, that keeps the record flowing well. I do have my reservations about this though. There's just something about the album that's not as likeable as I want it to be. I had trouble getting into to certain songs. I usually have no problem with long and winding music, hell I listen to artists like Iron Butterfly and Lou Reed for fun. However, this is missing that something to make the tunes that little more palatable. Something that opens up the sound a little bit and gives it some more colour. As is, the album certainly has its moments. I just wish there was that bit more to it to push it over the top. I'm definitely enjoying this album when I get in the mood for it. It's a bit of a departure from the usual sound that I'm used to. The riffs are pretty decent, the tunes are groovy and have that raw garage rock style that I think is a good sound. It's not a pristine, clean and polished record nor do I think it's supposed to be. 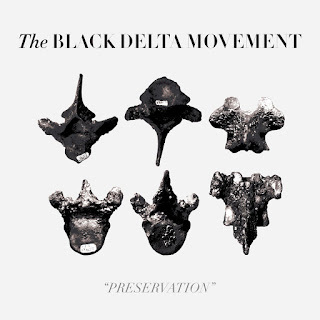 The Black Delta Movement has crafted a very unique album and I 'm sure it's not going to be for everyone but for the people who can get behind a raw sound with creative songwriting, it's a solid listening experience.